It was soooo good that I might need to buy a copy. The book is about enjoying the process as much as the end result and includes lots of patterns, profiles, advice, stories, and inspiration. One of my favorite "secrets" in the book is to find yourself a wise woman, someone who guides you along the knitting path, allows you to be your own weird self, never puts you down, and encourages you to take on new challenges. Another favorite is learning to knit without patterns. But for now I am still knitting with a pattern, this little matinee jacket I mentioned last week﻿. Sorry my photo of the photo in the book isn't great, but I was racing against the setting sun. You can see better pics on Ravelry if you'd like. While I can't wait to try going patternless, I'm loving this particular pattern so much I did some lunchtime knitting in my car at work today. Do you consider yourself a laidback knitter? Sounds like a great book - I think we could all do to be a little more laid back when we create, rather than making it a competition. The matinee jacket is so cute. Beautiful colour! Thank you for sharing this book Stacy, I think I might have to buy this one. It sounds a little like The Knitter's Life List, also wonderful. 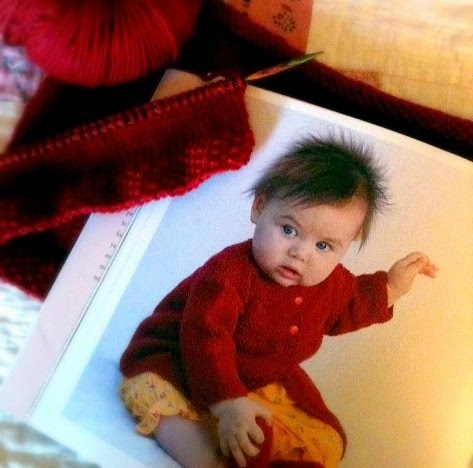 The little jacket you are knitting is gorgeous!! I'm going to make note of that book. Sounds like a lovely night of reading. Stacy, I can not wait to read your book, it sounds like a book I would love to own. 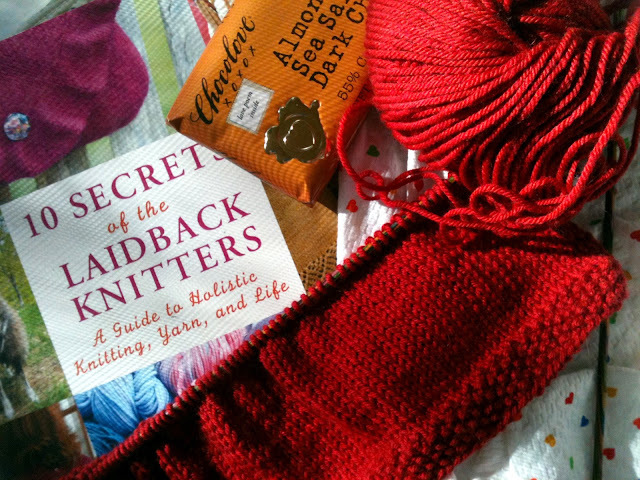 I am a laid back knitter sometimes, other times I am so uptight I have my family wondering why I knit! Great pattern for the little matinee jacket you are knitting and it will look so sweet on Lily! Sounds wonderful, wish I could knit:) I hope you enjoy this day too, HUGS! That does sound like a marvelous book! I'm not sure that I will ever get to the point where I can knit without a pattern though, I'm too much of a perfectionist. I also love the color you are using for the sweater, perfect! Sounds like a fun book. I don't really consider myself a laid back knitter. I'd love to learn how to knit without a pattern though. Thanks for a good book suggestion! I find there is satisfaction in completing a small project every now and again. so, yay, for the baby sweater. Love the hair on that baby. I am a beginner knitter, don't know if I'm laid back or not. I love knitting and am enjoying the process of learning.